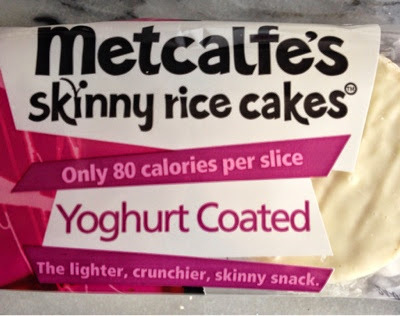 Yoghurt coated rice cakes...now isn't that a delicious thought? I'm a fan of all things pop corny and rice cakey! I think they are great things to have a nibble on whilst at the desk in work or when you're at home regardless of whether you are eating them for enjoyment or to lose weight. However I get a little bored when all there is available is plain/salt n vinegar/BBQ/ cheese I like a touch of variety and this is where Metcalfe's struts in. Now, I know what you're thinking, this is nothing new yoghurt coated everything has been around for quite some time but I just never really see yoghurt coated rice cakes that often. The rice cake itself is lovely because they aren't too thick, I find with other rice cakes they're massive wedges of nothingness which is so mundane to eat. 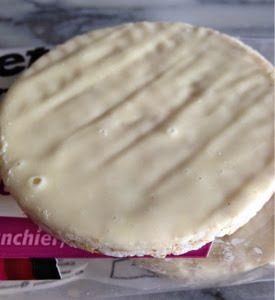 These also have a perfect amount of yoghurt coating that doesn't encase the entire rice cake only half of it. Yes it's nothing groundbreaking but my oh my are these yummy! Only 80 calories...which surely means I can eat the entire pack right? !